A wind chill advisory is currently in effect until 10am Saturday, with wind gusts of 35-45mph expected. These bitter winds could cause frostbite in as little as 30 minutes to any exposed skin. Take precaution when going outside. Long Island school districts remain closed for the second day. For specific town information, visit local websites which can be found in Recovery Resources. Report power outages to PSEG Long Island at 800-490-0075 or text OUT to PSEGLI. Follow @PSEGLI on Facebook and Twitter to report an outage and for updates before, during and after the storm. 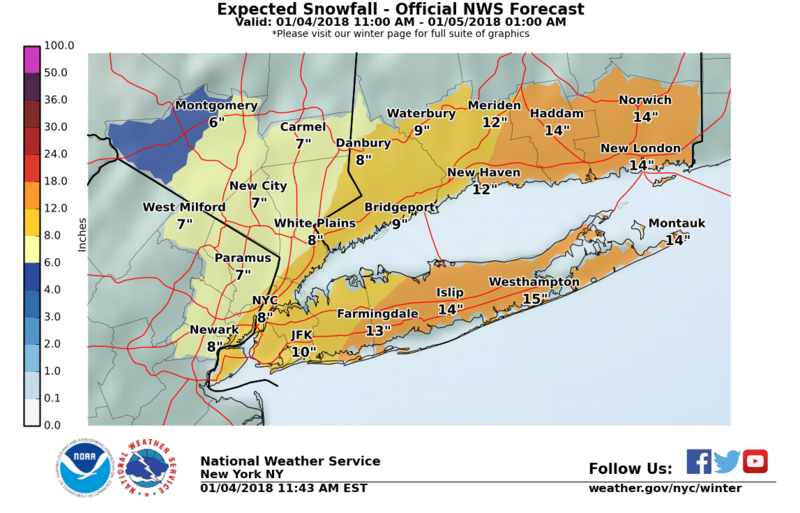 Governor Andrew Cuomo declared a state of emergency for Long Island as Winter Storm Grayson hit our region on Thursday. 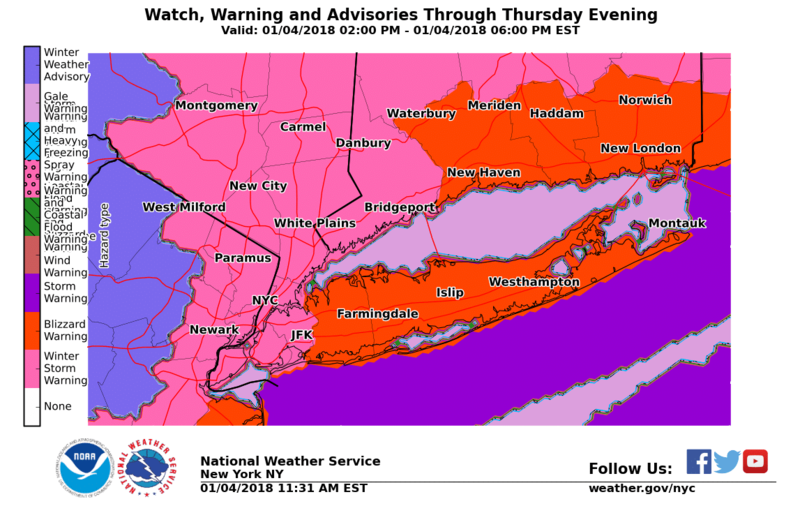 Nassau and Suffolk Counties are under a blizzard warning until 1am on Friday, with high winds and snow accumulations of up to a foot are expected. Conditions are expected to continue until 5-6pm, then should taper off. Tips on how to stay safe before, during and after a winter storm. There are delays and cancelations systemwide on the Long Island Railroad. Many flights are cancelled out of LI MacArthur Airport, Kennedy and LaGuardia. Check with your airline for updates. Town Huntington- all activities cancelled; limited town hall service call 641-351-3234. HART Bus and paratransit cancelled. Town Islip- senior and recreation programs closed. Town Brookhaven- senior and recreation centers closed. Call 631-415-TOWN with storm issues. Town East Hampton- Town Hall and all offices closed. Town Southampton- all town facilities closed. Town Southold- all town facilities closed. Southold Emergency Management opened shelters at Peconic Community Center at 1170 Peconic Lane, Peconic and Human Resource Center at 750 Pacific St, Mattituck for special needs non-medical persons. Town Shelter Island- all town offices closed. Town Hempstead- bus service to senior centers & shopping cancelled. City Long Beach- paratransit cancelled, bus service suspended until 4pm; Atlantic Beach Bridge closure on 1/5/18 has been cancelled.